Back in 1958 Gibson attempted to revitalise their popularity. Compared to Fender guitars Gibson's offerings were looking a bit "old hat" so three new radical guitars were designed; the Flying V, Explorer and Moderne, the former two making it into production, at the time very few of either were made as they did not prove particularly popular. 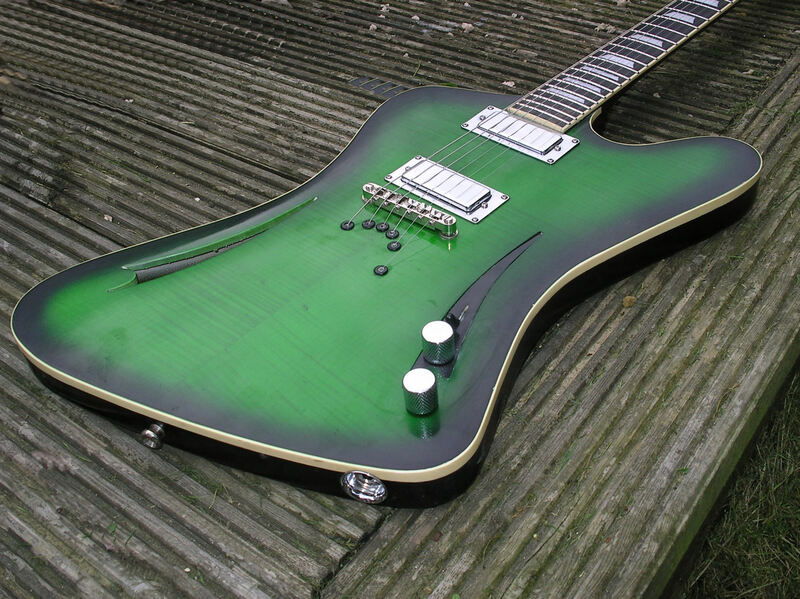 In 1963 Gibson decided to have another go at a groovy guitar design and came up with the Firebird, this was obviously based on the earlier Explorer with the corners more rounded and was meant to mirror car designs of the time. Talking of mirrored, Fender threatened to throw their toys out of the pram as in their eyes the Firebird looked like a reversed Jazzmaster... 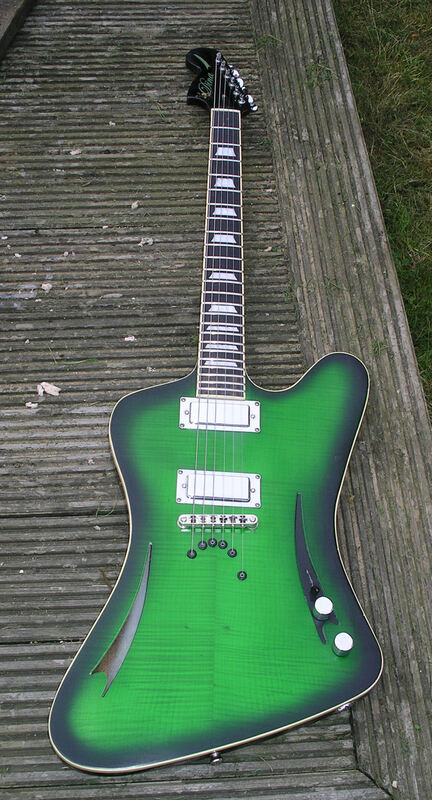 This model of Firebird retrospectively became known as the reverse model since later on Gibson introduced a none-reverse model (confusing eh!) which to my eyes looks hideous! Anyhow after that preamble lets get back to this guitar: I've always really liked the Gibson Firebird, it's unusual shape is not so far removed from a standard guitar that it becomes uncomfortable to play, they are well balanced and allow easy access to the last few frets. I also love some of its more quirky design features such as the reverse headstock, there are bits that I don't like but nothing that I couldn't modify to suit my taste. Also I definitely wanted to incorporate some of the "Dina" features into the guitar. 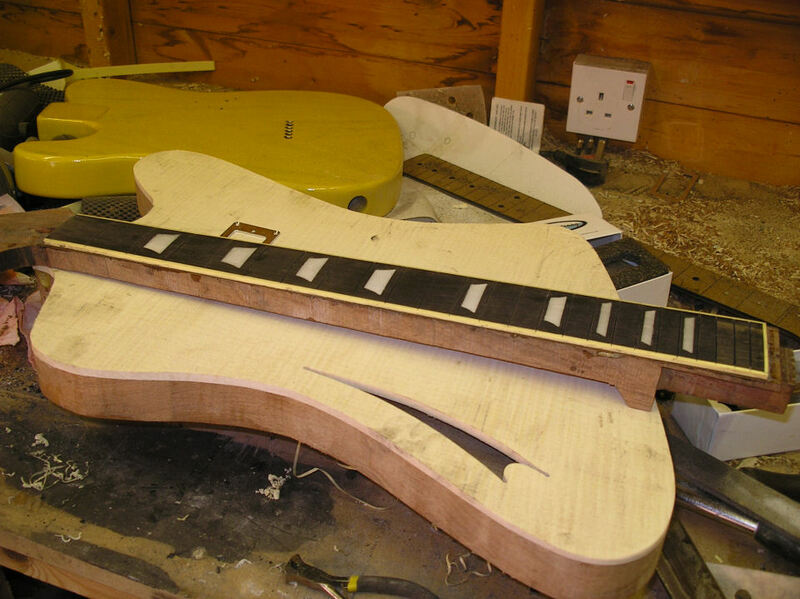 As this was more of a Gibson design I decided to stick with a set neck but went for a longer 25.5 scale length. Yes I know that the angled long reversed headstock is a disaster waiting to happen but this is one of the features I love about these guitars so that was staying. Anyhow more explanation with the pictures. 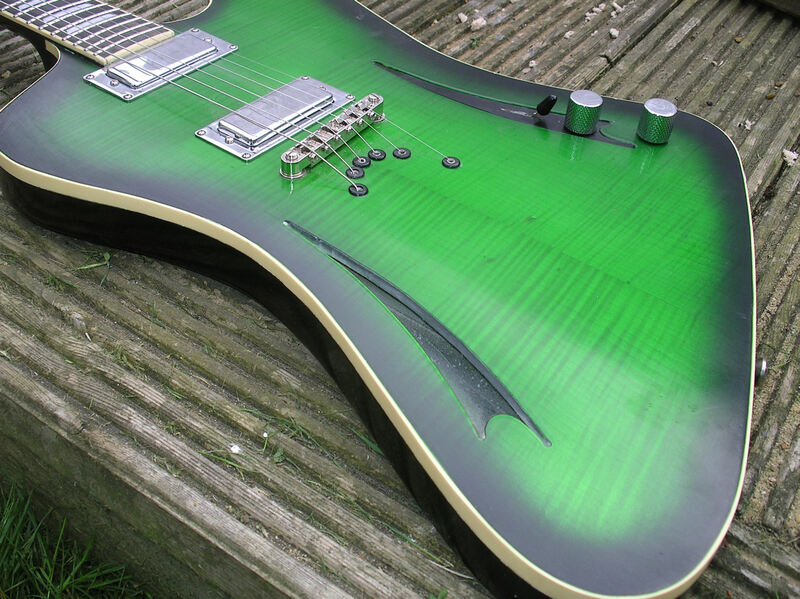 Just a taster of the finished guitar before the build pictures. Scroll to the bottom of the page for more pictures of it completed. 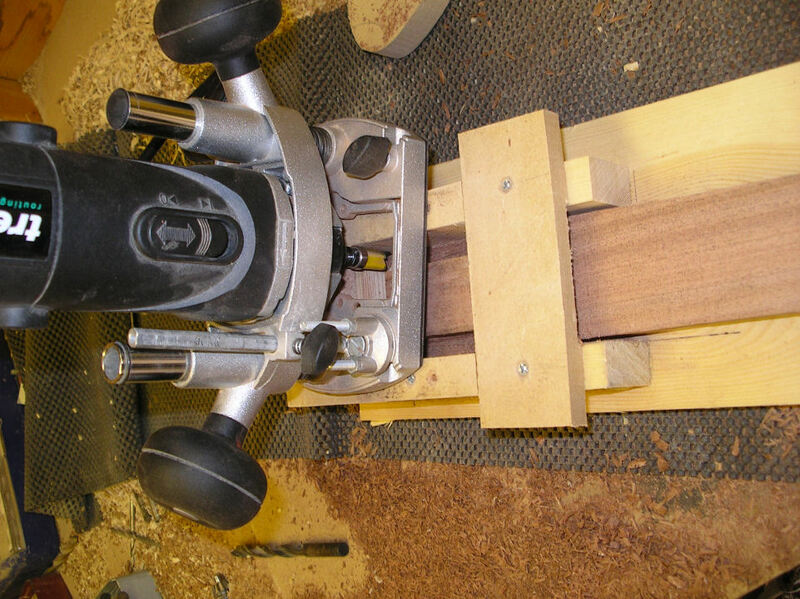 The body outline being cut from a good quality piece of quarter sawn mahogany. A plank this wide is quite rare although very heavy. 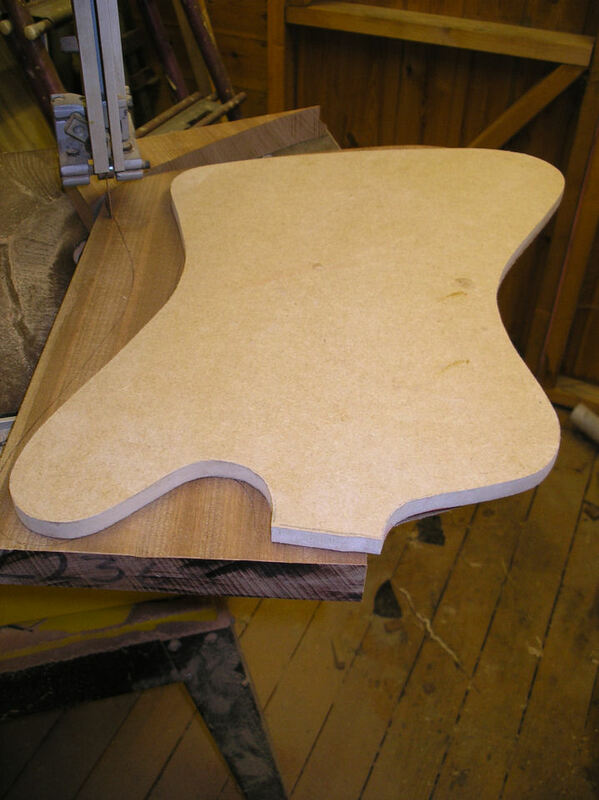 MDF template, even if I make a one-off guitar I always use templates it kind of prototypes the design, just in case you need to make minor changes. 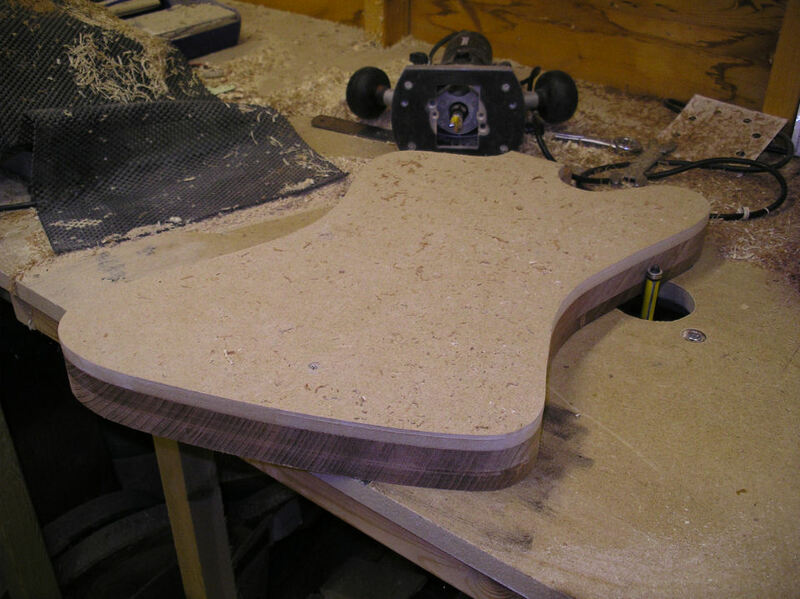 The body edge routed smooth using the template and a bearing guided router bit, although I would recommend doing it from the top with a hand held router, sometimes doing the whole depth of the side at once can lead to "tear-out" of the wood around some of the curves. 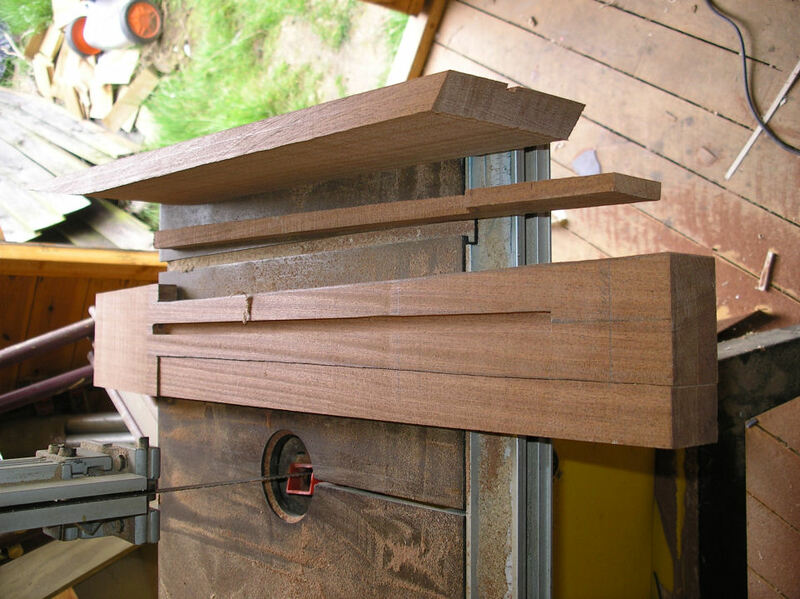 I wasn't too worried about the weight of the mahogany as my love for Thinline's meant that it was getting hollowed, templates being used again. Plenty of wood shavings later, here's the body hollowed out, this reduces the weight considerably. 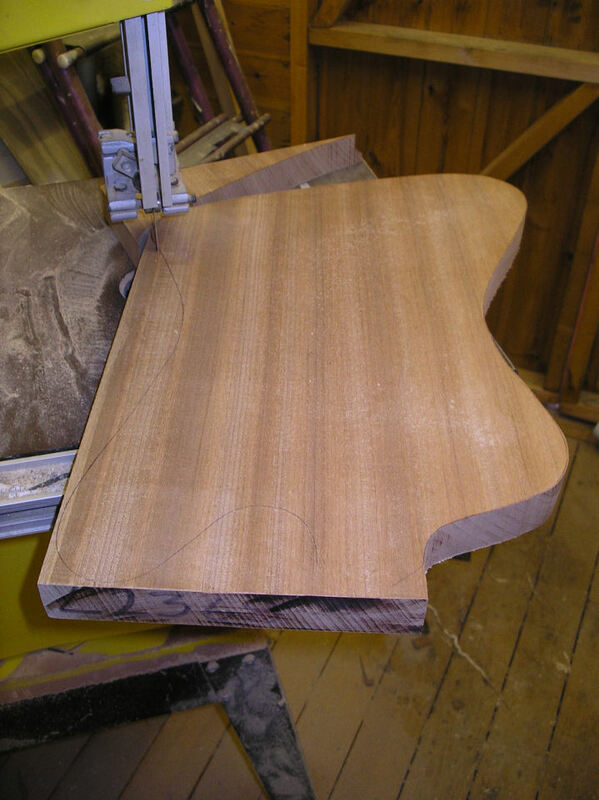 The gorgeous book matched maple top being joined, this is in fact European maple (Sycamore) it is a tad softer and lighter than its American cousin but just as nice. 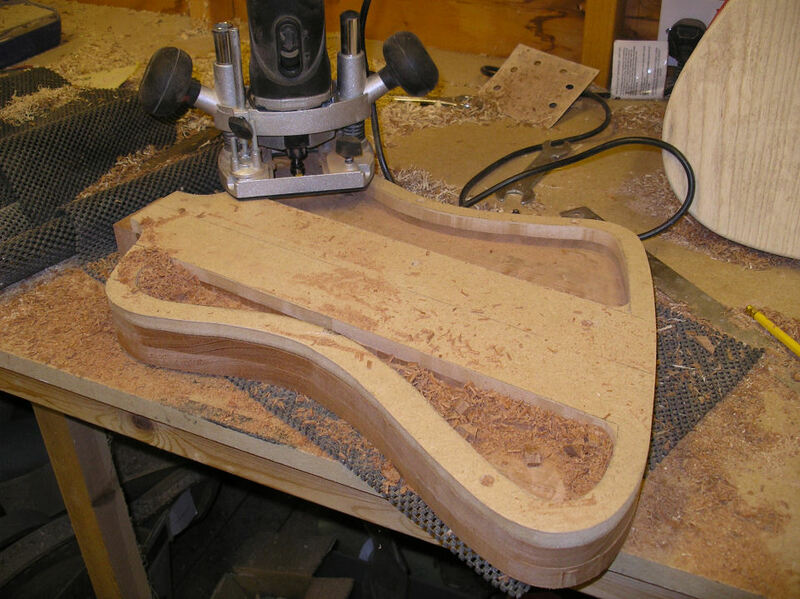 Some of the "Dina" features are coming to view by now, here's the top and back ready to glue together. The top glued on and cut roughly to shape, that's the plan underneath with my workings out for the neck angle. 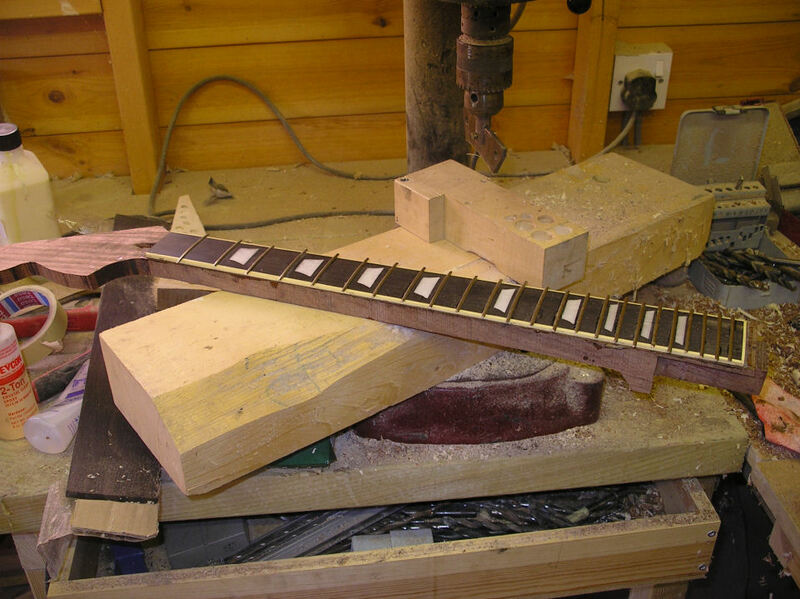 It was at this stage that I confirmed my ideas for a 24 fret neck. Starting work on the neck, I decided to use a channel type truss rod, the neck is one piece quarter sawn with angled reverse headstock. 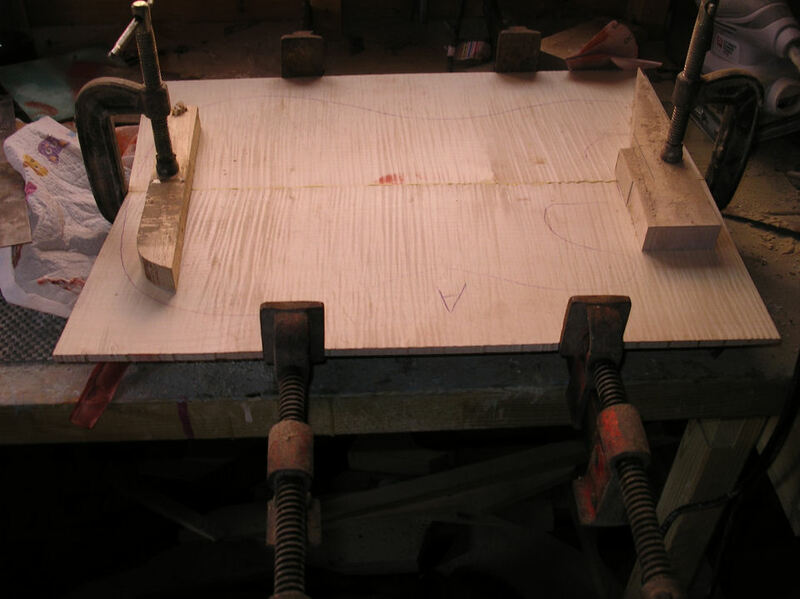 Here's my jig for routing the neck joint, all will become clearer in the following pictures. 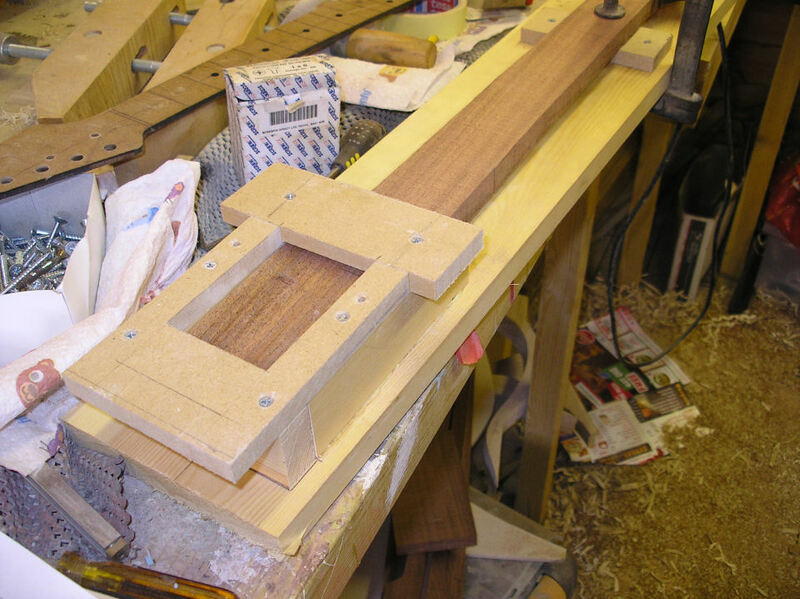 The neck angle is critical, I didn't want to use a Fender type bridge; either a hard tail Strat or Tele type as I didn't think it would look nice on a Gibson type guitar, I wanted to use a traditional LP type which requires an angled neck to achieve the string height to go over the bridge, but not too much of an angle that the bridge and pickups have to be adjusted stupidly high... Anyhow more pictures. My routing box for the neck heal. Woop...Woop!!! 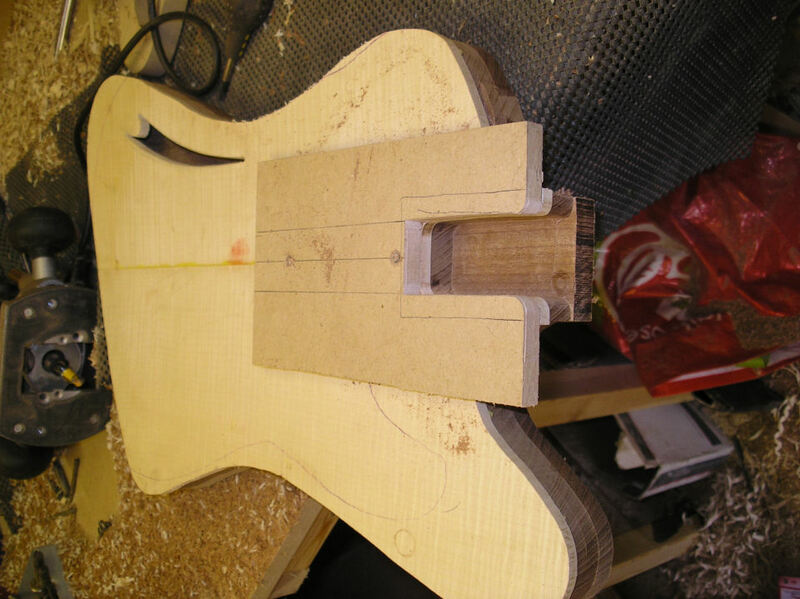 Nicely angled neck joint, I do like it when a plan works! 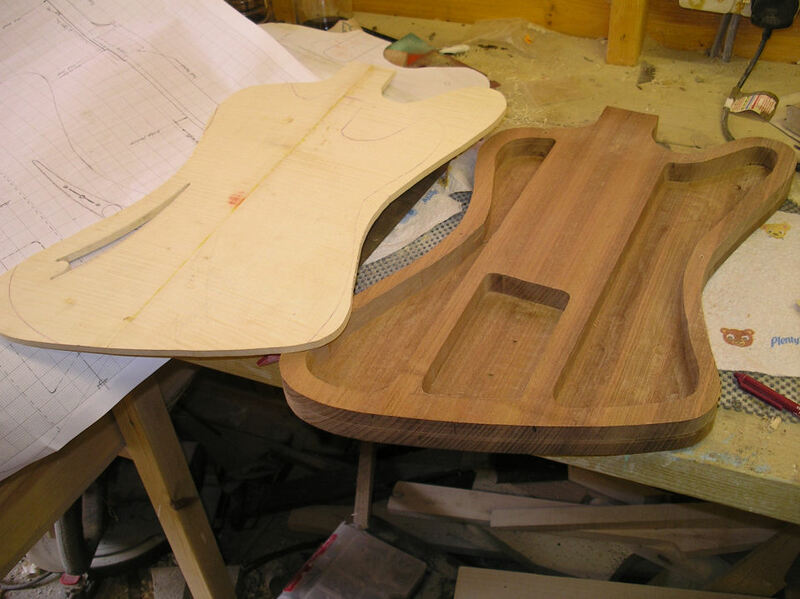 The body end is somewhat easier as no angle needs to be accommodated into the template, with the neck end cut I made this template to fit snuggly to the neck then screwed it to the body where the pickup routs are going to be and let the router do the rest. Half way through a couple of days work, I'm using an ebony fretboard with reversed LP pearloid inlays, I think this way around they match the "F" hole and headstock. This takes a long time to do! I chose to use a 24.5 Fender scale length as I'm more used to it and it gives me slightly more space for the pickups with the 24 fret neck. Fretboard glued on to the neck and binding fitted. Sorry I'm not the tidiest of workers sometimes! 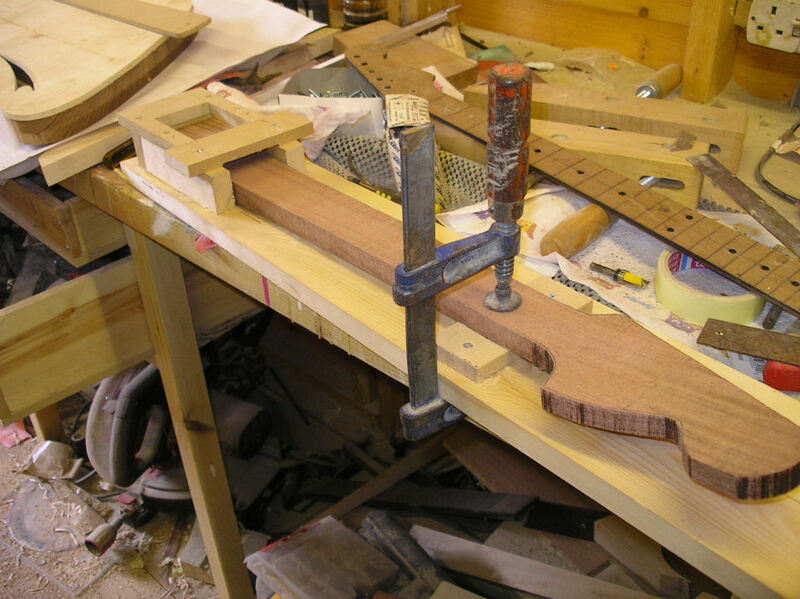 Pressing the frets in, as with any bound fretboard the fret slots are cut before the binding is glued in place and the fret "tang" is nipped away before pressing into the fretboard. 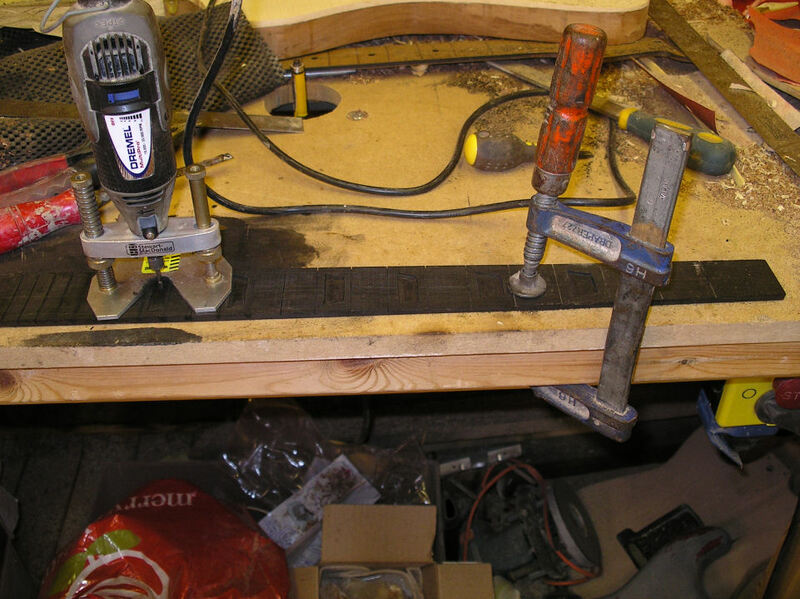 Here's the binding fitted, not too difficult on a flat top guitar, you can see my simple "fence" over the router cutter to do the rebate in the body, I also warm the plastic binding with a heat gun so I can mould it to the body shape before gluing it on. I've cut the pickup cavities as well. 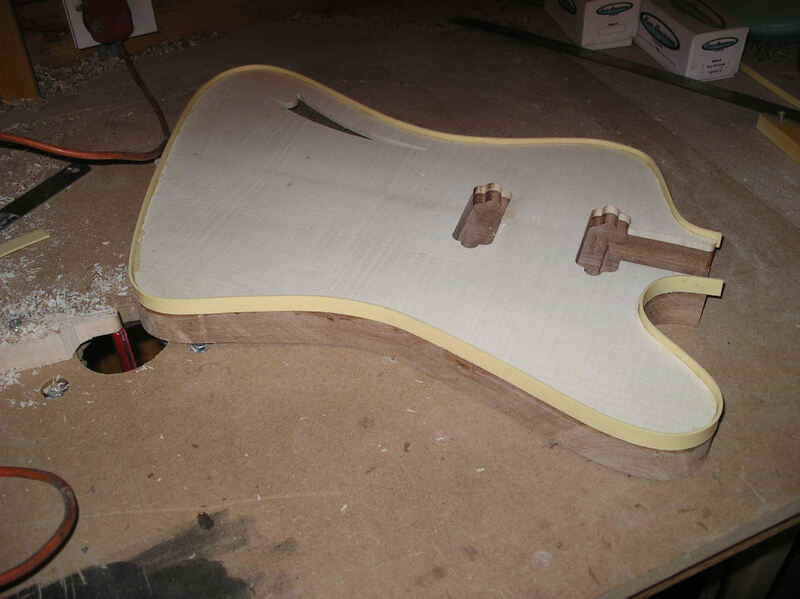 Most of the rest of the work is pretty standard guitar "stuff", shaping the neck and finishing. So I thought I'd jump forward to the end result. At various times in the construction of this guitar I had been tempted to resign it to the back shelf as I wasn't sure if it would "work". Although it's a tried and tested shape, there are quite a few features that I've added like the thinline body, stylised "F" hole, through-body tailpiece and 24 fret neck. Overall I'm quite delighted how it's turned out. 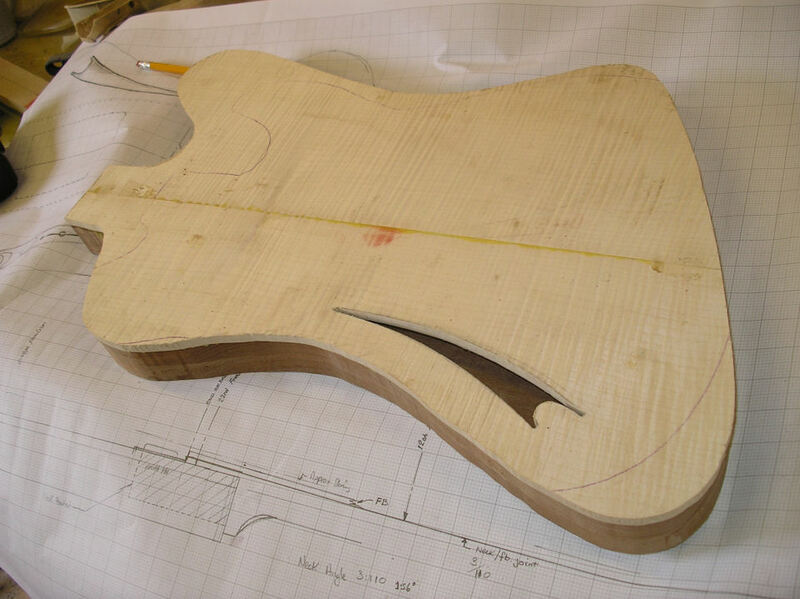 The nice thing about building your own guitar is the blank canvas that you have to create your own design. I love taking a tried and trusted classic shaped guitar and changing things around a bit, adding some of my own and favorite features from other guitars. 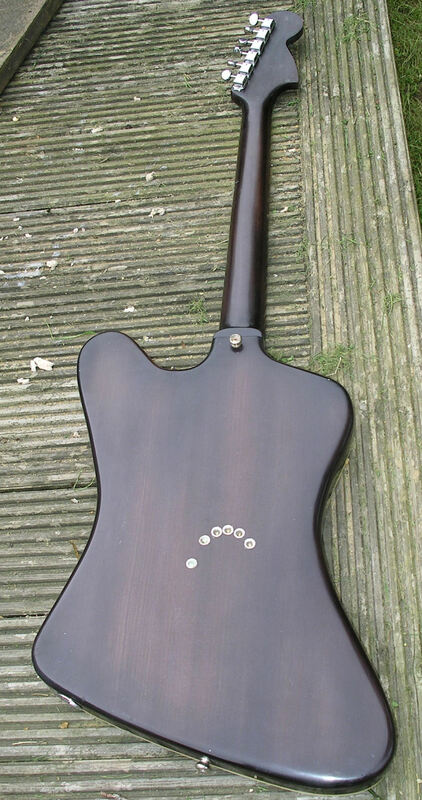 One of the very late design changes on this guitar was the string-through body, I knew that I didn't want to use a Strat or Tele type bridge, to my eyes that would look awful, but then again I've never been that keen on a stop tailpiece, they look a bit agricultural and would hide some of the flamed maple top so I came up with this hybrid arrangement which I really like. Here's a closer view, I had a local engineer turn up some stainless steel long string guides to push through the body and finished them off with the black surrounds which were filed down beads from my wife's craft room! Also notice the recessed black control plate mimicking the "F" hole, nothing fancy on the electrics, just three way selector switch, Volume and tone. One of my favorite features of the Firebird is the reverse headstock, the neck was quite a departure from my usual type as it has an angled headstock and a set body joint, also notice the fret markers, they're reverse fitted Les Paul, a simple small design change that makes all the difference... I have tried to match the curve of the "F" hole throughout the guitar; headstock shape, fret markers, control plate, and string through tailpiece... I just feel that it keeps a bit of continuity going throughout the guitar. 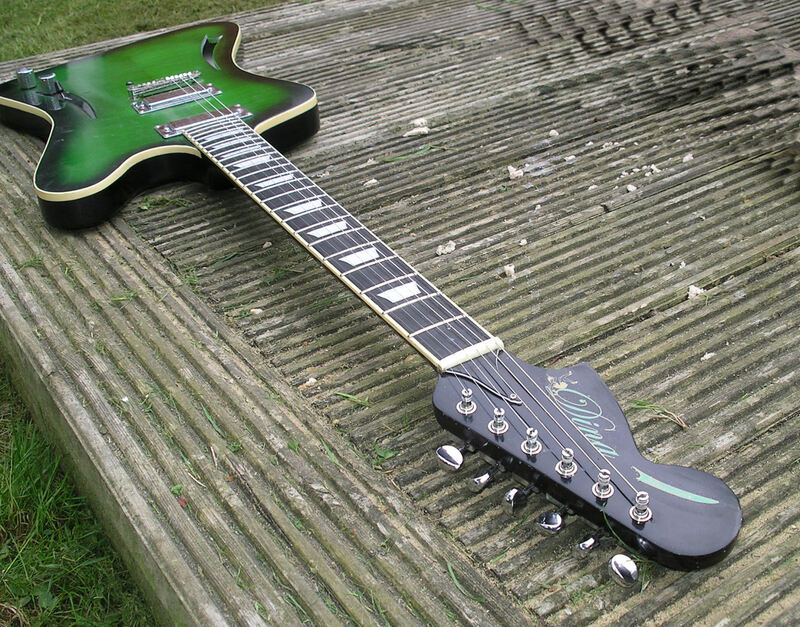 Another late decision was the colour, I was going to go for the typical tobacco burst, but then thought I'd like something a bit more modern, I toyed with many colours but settled on green and black and I absolutely love it, so pleased with the colour combination. There aren't many aftermarket choices for this type of mini humbucker pickup, but I'm more than pleased with these Kent Armstrong's, very sweet sounding with a brighter sound than a full-on humbucker and very versatile. Not that I'd have thought it when I started building this guitar but it's quickly becoming one of my all-round favorites. As I previously said there were a few points in the build when I wanted to throw it to the back of my shed and forget about it, but a lot of the design features have married together very well. The 24 fret neck is balanced perfectly by the larger than normal body(behind the bridge), the string-through "tailpiece" gives wonderful sustain, it's a very light comfortable weight due to the thinline construction, the shape allows excellent access to all 24 frets, it has a vintage playing feel as the fretboard is 12 inch radius with a rolled edge.... A classic shape but unique. 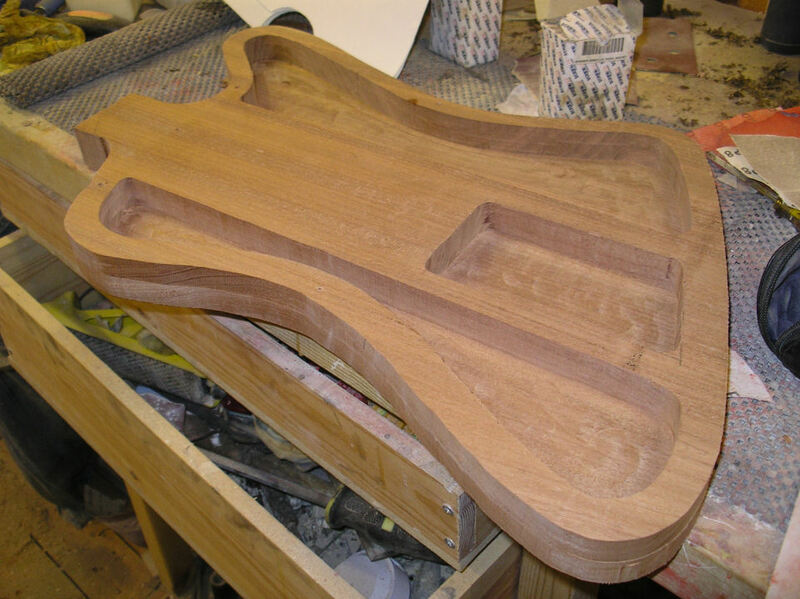 Body: Quarter sawn mahogany, thinline construction with flamed sycamore bookmatched cap, cream plastic binding. 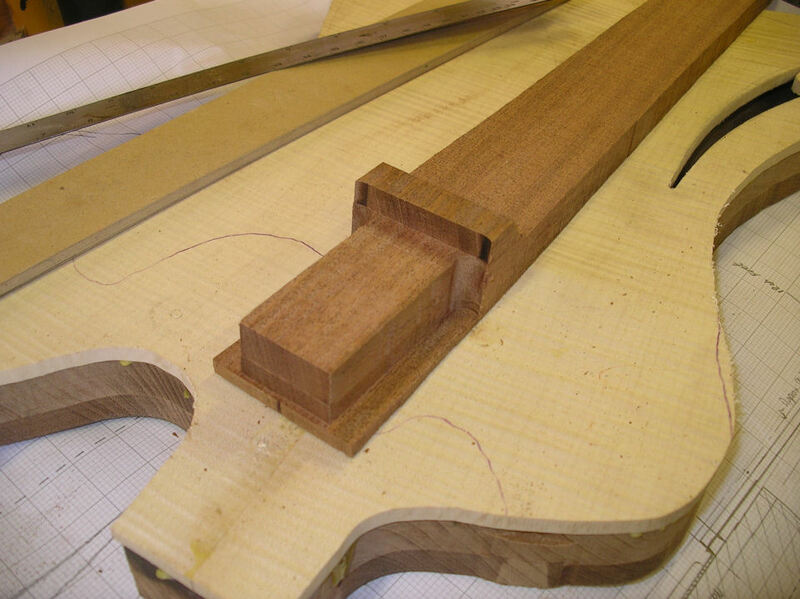 Neck: Quarter sawn mahogany set neck, angled reverse headstock, slim profile. Fretboard: Bound 24 fret, ebony, reverse fitted crown mother of pearl inlays, vintage size jumbo frets, 12 inch radius, bone nut. Pickups: Kent Armstrong, Firebird mini humbuckers. wired via three way switch and simple volume and tone. 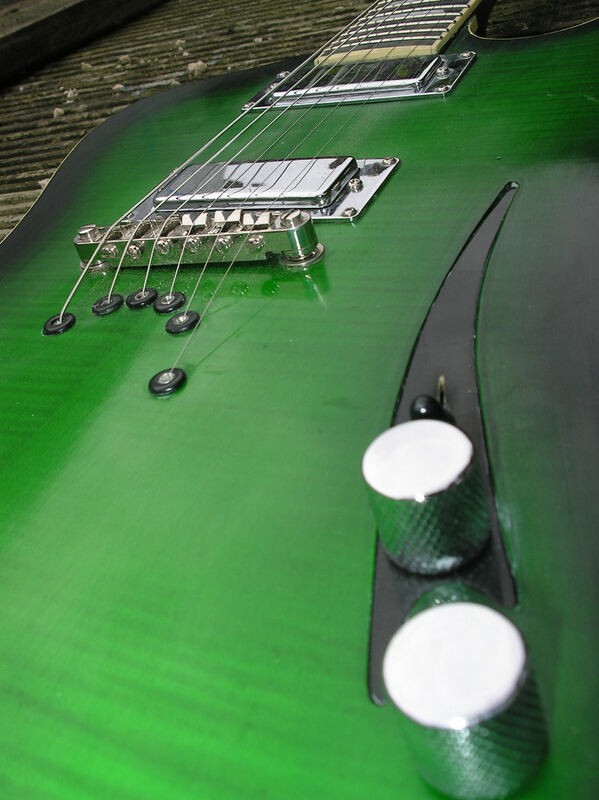 Finish : Nitro cellulose green and black tinted lacquer.